Saltwater Clams belonging to the family Tridacnidae is among the most colorful non-fish species which you can add to your coral and reef tanks. Unlike the normal grayish colored clams which are served on dinner table, these are totally different as they are considered the exotic species kept in saltwater tank. They made wonderful addition to complement your colorful fish and believe me, it’s the dream of any saltwater aquarist to keep them as pets while some would even say that the aquarium will never be complete without presence of these giant saltwater clams. Although they never move around or impress people with their movements but their mere presence and the showcase of colors are enough to convince people to make these clams one of their favorite additions. All the species grouped into this family are highly popular and known for their pigmented mantles which are basically the outer flesh appearing on the edge of the lips. These mantles depending on which species can vary in different colors and the intensity plus the pattern markings are the ones which attracted the most attention. Lately there has been a boom in the aquarium industry supplying giant cultured clams which are specially bred in large artificial reef tanks in order to supply to hobbyist worldwide and a single well-developed specimen can cost anywhere between $50 to few hundred dollars. I would advice those who intend to try their luck in keeping this species, to learn as much information about their pets and most important is that when scouting for these giant clams to add to your fish tank, you should first find out how old the clam is. Reason for this is simple because specimens either too old or too young often find themselves unable to adjust to sudden change in tank environment and finally often leads to complete failure. As a rough guideline, the right size of the clam should be within 3 inches length. I’ve even come across aquarium tank services which provide maintenance and supplies and you can try to approach them and request to include these friendly creature as part of the package when setting up your home aquarium. I’m not sure whether those services are available in other countries but the key thing is to search thoroughly and ask around. Caring for these giant clams require special attention and the job can be very tedious as you will need to ensure that the tank lighting is correct while the foods are abundant. VHO or sometimes called a very high output full spectrum lamp is usually selected for use in saltwater aquariums housing these invertebrates and without sufficient illumination and enough intensity, the clams can lose their colors easily up to a level which can endanger their survival. Depending on requirements and suitability, sometimes metal halides lamps will work as well. The water which they live in must be rich in nutrient with the phytoplankton and algae as their foods while nitrate level is best kept within 50ppm limit to ensure that they grow and thrive in the water. Unlike a fish which actually accepts pellets dropped into the water, these clams don’t require all that as their food source is actually the microscopic organisms present in the water itself and they feed by filtering out these particles as the water flows through. A healthy specimen is judged based on its responsiveness to movement in the waters and of course the color is the major consideration above all. 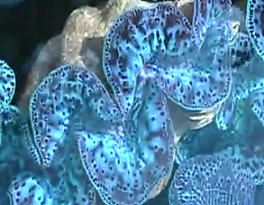 Few of the most commonly found species of the giant saltwater clams are the crocea and maxima clams which are also native to the reef areas around Tahiti. They are quite expensive due to their intense green and bluish coloration and normally those offered for sale are wild specimen harvested from the sea. Both of these are the most sensitive of all compared to the likes of deresa clams which are yellowish as they will require high output lamps to maintain their natural colors. Predatory problem is also another thing you might want to look into and study careful because even aquarium fish living in the tank itself may turn out to be the one threatening their survival. Parrotfish especially with their hard beak-like mouth will crush them easily while butterflyfish and angelfish which have a knack on nibbling their fleshy mantles will cause lethal injury to your pets. Introducing wild caught specimen has its disadvantages not just in the aspect of mortality rate (obviously lower) but also, they might potentially become host to some parasites that attach to their surfaces and then accidentally introduced to the aquarium. » Possible to use natural seawater to replace synthetic water?